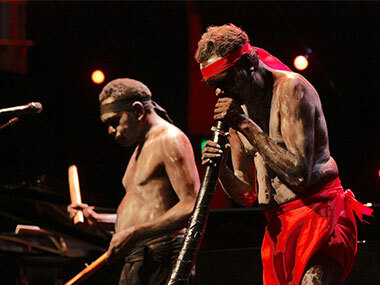 What better way to prepare for Australia/Invasion Day than by spending its eve with 'Bambula'? 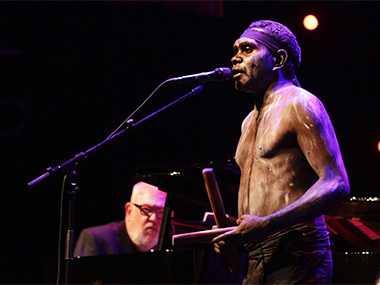 For this offered the ancient musical traditions of Yolngu Arnhemland transported to Sydney – as they so rarely are – and given a more universal context which we Southerners might hope to comprehend by the piano mastery of Paul Grabowsky. Would surtitle translations of the Yolngu words have helped even more? They might have amplified and introduced us to the poetry of this vital, ancient and living culture, so much older and so different to white Australia's. But the combination of Daniel Wilfred's commanding clap sticks communicating much more clearly than his impassive face and Grabowsky's active visage, constantly changing with the mood of the music were pretty effective alternatives. 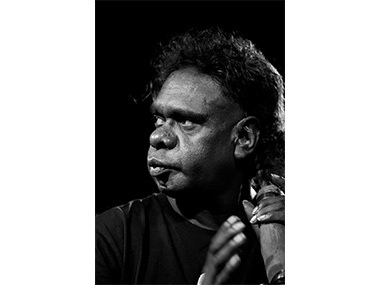 The Wilfred Brothers - Daniel the on-stage bossman and singer, and David the yidaki player and manager for the manikay songs of his Nyilipidgi Country in south-east Arnhemland - have worked with Grabowsky for a decade. 'Crossing Roper Bar' was their first collaboration, involving the Australian Art Orchestra. Now, they've cut the numbers radically to just three – allowing the purity of the manikay tradition as it manifests everything from deep ceremony to everyday life to emerge, and challenging Grabowsky to find a musical language that matches mood and intensity without seeming pointlessly derivative. The closest he came to the latter was in simply following the common descending note pattern of Arnhem music. But that was right at the beginning as Daniel chanted about the Stringybark tree and its flowers – maybe reflecting on seasonality and increase in Yolngu cycles. A later song moved on to the honeybees and birds that feed on and pollinate those flowers, and now the piano seemed to be interpreting the erratic movements of those birds and bees. As Grabowsky himself describes it, his piano was acting as an “existential mirror”. Mostly, David's yidaki was a consistent low thrum. But the barking of a puppy and the cawing of Wak Wak the crow offered opportunities for imitative variety. David even got to sing the last number about Dum Dum the owl. But it was Daniel holding the floor and, apparently, the music together that held my attention. As the youngest member of the Young Wagilak Group (named, I assume for the Wagilak Sisters who created the world for the Dhuwa moiety in Central and Eastern Arnhemland), he's obviously an elder in the making. His voice is hoarse and sweet, not yet deep and earth-shaking like the great Djakapurra Munyaryin. But that will surely come. Are the Yolngu improvisers, though? That question nagged in the mind as the Wilfreds stuck to their tasks, allowing their songs to be broken up by Grabowsky's at-times, almost classical piano interpolation. And he occasionally turned pages of music – so I suspect a show that originated in Melbourne in 2015 had a fair amount of planning behind it. Clearly, the Wilfreds needed no score, for, rather than a baton, those magisterial clap sticks dictated entry and exit points for all in the trio. Bambula, like many words in Indigenous languages, means many things. It signifies a ceremonial ground, a sacred site, and the place from which things originate. In the words of Daniel Wilfred, “it is the place where the ancestor’s fingers touched the ground.” Grabowsky translated this as singularity. And the greatest sense of this occurred for me in the 'Wak Wak' song; for here, Daniel added hand gestures to his words and David's cawing; hand gestures which suggested the crow up there, me here, and the earth or Country beneath us all. He then introduced us to absent members of his family and their relationship to the crow. Who'd have thought that such a mundane avian could attain such significance?